Home Training Tips Free Weights vs. Machines: Which is Better? Free Weights vs. Machines: Which is Better? The eternal debate. Which is better: free weights or weight machines? When it comes to building more muscle, bodybuilders are always looking for even the smallest ways in which they can improve their lean gains. In this spirit, all of us have had the chance to overhear steamy gym arguments over the best way to train. So let’s end this argument once and for all, because this one is really about facts vs. myths. Here we go! Just a quick reminder of the importance of weight training, which can be the most beneficial form of physical exercise for the most common goals of exercising: leanness, health, strength, power, endurance and athletic aesthetics. So regardless of your age, gender, typical inclinations or specific goals are, you’d be wise to make some room for strength training in your fitness program. There are already dozens if not hundreds of studies which demonstrate the literal power of strength training to sculpt your body and strengthen your muscles, but also burn excess fat and improve cell health. Any experienced bodybuilder will generally tell you that free machines are superior because they allow the trainee to activate more muscles throughout the core and groups of stabilizing muscles. This, in turn, stimulates greater overall muscle growth. But if he’s being truly honest with you, he’d also tell you that machines, on the other hand, can be super useful when the trainee wants to isolate some muscle more precisely and then hammer it with all possible intensity. The truth is that, as with anything else, both approaches have their sets of benefits and flaws. And if you learn how to use this to your advantage, it might help you unlock another step to your journey to a god-like physique! The best thing about hand weights is that they’re inexpensive, easily portable but also highly effective. But, if you only train with them, you’d miss out on the great blessing of resistance machines: they allow you to entirely focus on targeting a specific muscle. However, they are expensive to have at home and they may provide a lousy workout in a public crowded gym, especially if you rely too much on machine-based movements. 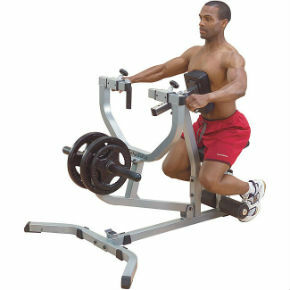 Get on a chest supported row machine and find the right position from which you can pull the weight in a relatively comfortable motion. Keeping your back arched and the chest and lower back stuck out, squeeze your shoulder blades and then follow the movement with your arms. 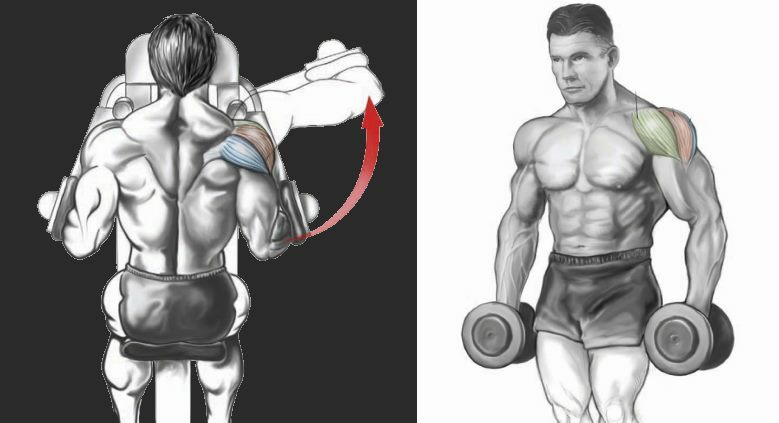 Slowly lower the weight back to the starting position and relax your lats, traps and rhombs. 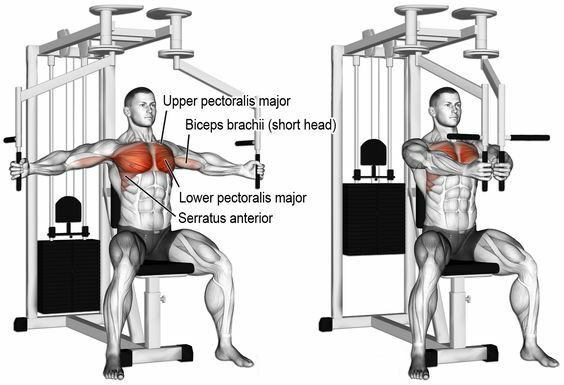 Throw a peck deck fly machine exercise at the end of your heavy duty chest routine, as this will allow you to isolate the pectoralis muscle without putting undue stress on the rotator cuff. 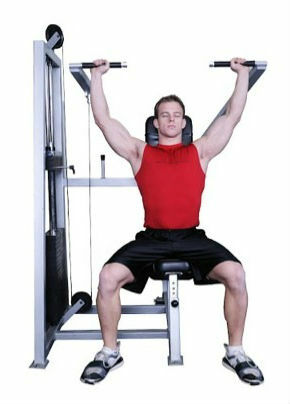 To get it right, adjust the seat on a pec deck fly machine so that your torso is straight. As you keep your shoulders pinned back, squeeze the weight through the middle of the chest, then lower the weight back while keeping the pecs tensed at all times. To get the most out of this move, make sure you keep your form flawless. Your anterior delts will be “thankful”. Set up the machine so that your starting hand position is at about chin level. Press the weight up, while keeping your traps down. Make sure you don’t go full lockout at the top. Slowly lower the weight down at eye level and press back up. If you’re primarily using free weights, once in a while your core muscles will quit the game before the primarily muscle itself is fully worked to the desired maximum. Machine weights, then, present another problem: they are not a one-size-fits-all, so they can be uncomfortable, useless or downright dangerous for some body types. Machines are are also fixed to an axis that will only allow you to move in one or two planes. Also, don’t forget that free weights allow you to use your body in all three dimensions, or planes of motion: forward-backward, horizontally and vertically. So it’s only natural that this training style engages more muscles, especially strengthening the often neglected stabilizing muscles in the core. So ultimately, the choice is yours. But if you are very well aware of the characteristics and big benefits vs. flaws of each option, you have increased chances of making a great decision. You may eventually opt for hand weights, resistance machines, resistance bands, or bodyweight exercises… that’s really unimportant in the bigger picture of things, actually. However, if you make sure that every exercise you perform is done in a super-slow style or in another intensity-boosting way, you are guaranteed to get good results with any training style. Just focus on working the target muscle or muscle group with optimal intensity and make sure you reach a high level of muscle fatigue. A day or two of proper rest, recovery and diet will do the rest.